This poor sewing kit has been languishing on the shelf for a few weeks now, waiting patiently for a blog post of its own. Well, today is the day! Ever since I saw Melinda's version, I wanted to make one of these sweet little bags. The pattern is a bit tricky but well worth your time. You can purchase it here on Craftsy. 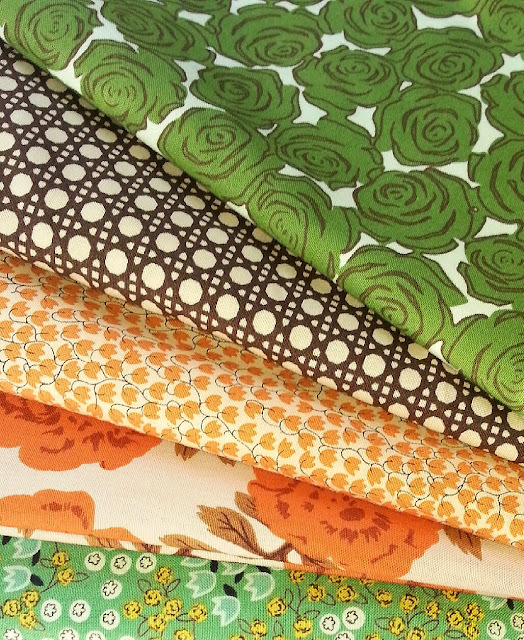 The main fabrics in this piece are from the Wash Day collection by Makower UK for Andover Fabrics. I just love the colors and designs in these fun prints. They've been a big hit with my girls, too, all of whom can't get enough of those clouds and clothespins. Yes, my Sunday Stash Link-up post was meant to be up yesterday, but we'll just smile and pretend that I'm not late to the party that's supposed be happening at my own blog. Sigh. Just when I think I have all my ducks in a row, one of them goes swimming off to the deep end of the pond... My thanks to our gracious hostess Fiona of Finding Fifth for not banishing me from Sunday Stash link-ups for life! This year I've started a fun little habit here at Fabric Mutt that I call "Fabric Auditions." Every week or so, I pull a stack of fabrics according to a certain theme. Some of them end up becoming actual projects and some are just a pretty stack, but it's all good fun and great practice for the design portion of my brain. I highly recommend that you give it a try with your own stash at least once a month. This week's stack is called Autumn Sky, and it's destined to become a lap quilt for my father. My dad was loving the colors in my California Road Trip bundle (which you can still purchase from Tactile Fabrics here, by the way), so I tried to come up with guy-friendly prints that were along those lines. I ended up with a bundle of fabrics that were a bit more saturated and almost woodsy in flavor. This will be the first quilt I've ever made for my dad, which I'm kind of excited about too. I'm hoping to have finished pictures in the next month, so stay tuned. Have some fabric in your stash that you'd like to share? Take some pictures, write a post, and show it off! 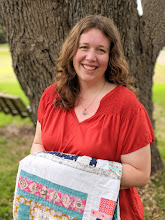 When the amazingly talented Janice of Better Off Thread started showing peeks of her new Round the Blocks pattern on Instagram, I was excited. When she gave me the chance to pattern test the block for her, I was absolutely thrilled. This quilt block is full of possibilities, and her fantastic pattern instructions make the process of paper piecing and sewing curves completely doable. As I started rummaging through my Heather Ross scraps for the little windows, the idea suddenly came to me: a storytelling pillow! My husband is a genius when it comes to bedtime stories. I often hear him spinning tales to our daughters in the evenings about the three little hippopotamus sisters who live in a tree house in the forest of Galamagoo -- and who (strangely enough) are usually having an adventure that coincides with whatever activity the girls are planning to do the next day. My daughters adore story time with Daddy, and they've gotten so that they love telling stories to each other too, so a pillow like this is going to get lots of use. The process for using the pillow is simple: pick a main character from the four choices in the middle circle, add in a few details from the ring of characters, and then choose a setting from the corners. You can mix and match in so many ways that the options really are endless. I used a cheater print by Jay-Cyn Designs from the Storyboek II collection for the back of the pillow. I figure this throws a few more characters into the mix if need be, and I love the whimsy of these designs. Click on over to Craftsy if you'd like to buy Janice's brilliant pattern for yourself. At just $3.95, how can you resist? She has some other wonderful options for this block too which you can see at the link above. I really can't wait to see what everyone else makes with this. Meanwhile Bunny just got her first chance with the storytelling pillow on her afternoon school break. As I type this, she's over in the corner with the pillow in her lap talking softly to herself, "Once upon a time there was a Daddy Mouse, a Mommy Mouse, and a Baby Mouse, and they all lived together in the crazy pond..."
I can't wait to hear how it ends. My first contact with The Glamorous Housewife was through the pages of Country Living Magazine, and I admit that I still sometimes stop by here to revisit those gorgeously inspiring photos of Bethany's California house. One look at the incredibly chic yet practical details she featured in her interior decorating, and I knew that this was a blog I needed to visit. Bethany's website is a home for all things vintage, showcasing hundreds of ways to add retro touches to your life while still living in a modern world. I don't think a week passes without my picking up at least one great idea from her blog, so when the opportunity opened up to be one of her contributors, I naturally jumped at the chance. 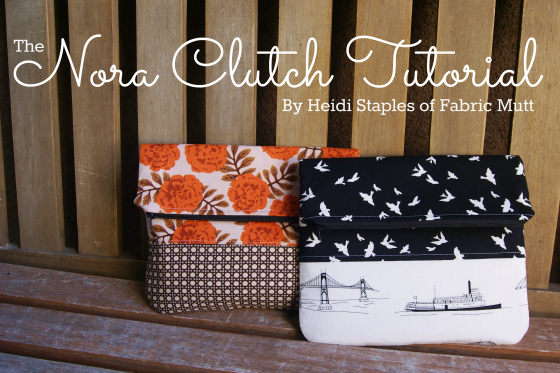 Today you'll find a tutorial on The Glamorous Housewife for the little clutch I shared here a few weeks back, now officially christened the Nora Clutch. This bag is about the easiest thing in the world to make -- less than an hour to cut and sew the entire thing -- and it's roomy enough that I've had no trouble using it for regular daytime errands with three children in tow. With Christmas inching closer on my calendar, I'm also adding this project to my list of cute, easy gift ideas. Head on over to Bethany's blog to check out the tutorial and be sure to take a look around while you're there. I promise you'll enjoy yourself. This weekend I tackled my very first frame purse, and overall I think we can call this a positive experience. My fingers are still pretty sore after sewing the bag into the frame last night, but otherwise it was fairly painless. The frame is a large one -- about 13" from one end to the other -- so this is a full size handbag, not just a coin purse. I'm not going to pretend that this was the best sewing job I've ever done -- that visible hand stitching on the lining around the inside of the frame makes me a little antsy -- but for a first attempt, it turned out okay. I used this tutorial to draft my pattern and sew the bag together, adding in an extra layer of Pellon 70 interfacing to help the bag stand up the way I wanted it to. I enjoyed pairing Anna Maria Horner's Field Study print with one from Juliana Horner's new Rosette collection. The colors look so perfect together and I love the mother-daughter connection. I added a wood grain print from Aviary 2 for the handles which seemed like more fun than buying a set of wooden handles for the top. So Miss Mouse has been feeling a little unsettled by this whole "school" business. Suddenly her big sisters are busy with fun activities, and she's not been entirely sure what to do about it. My parents and I have been trying some different ideas to keep her engaged during class time, and when I saw this week's Zakka project for the Patchwork, Please! sew along, I decided to turn it into something special for Mouse. I've been dying to make this project ever since I first opened my copy of the book, but unfortunately wall space is at a premium right now. Instead, I made one envelope block, one pencil block, and one book block from Ayumi's "Books for Baby" quilt. I sewed them together and turned them into a little activity pocket pillow. I didn't have a pillow form on hand that was the right size, so I decided to just stuff the cover itself. Honestly, if I had to do this over again, I would have made this into a separate piece and sewed my own little pillow form to put inside. Hindsight always gets me... Still, this works well enough. I can tuck flashcard rings, books, and snacks into the pockets for Mouse to find when she dances (yes, dances) into our new reading corner every morning at the start of school. It's just a little thing, really, but sometimes it's the little things that make the biggest difference with kids. Linking up to Finish It Up Friday and the Zakka Along. My little Bear inspired this fabric bundle with the prints she chose for her quilt over the weekend. These bright, saturated colors make me think of frosty scoops of rainbow sherbet. My girls would definitely approve. When my mom asked if I could make her a little pillow that she could use on long drives in the car, I brought her a stack of charm square packs. It only took her a minute to settle on Eric and Julie Comstock's darling new S'more Love fabric. I am constantly amazed by the collections released by this talented couple. Every one of their lines has at least one print that I have to buy in yardage. In this case, it's those fabulous little owls which I love best in orange and brown (you can see them here), though I may have to add a few more prints to that list before I'm done. The colors in this line are right up my alley -- that grass green and rusty orange build a perfect bridge from summer to fall. A little patchwork, a little Kona Grass, and presto: a happy little pillow. We finished the last of the quilts for my girls this weekend -- the special Mommy-and-me-sewing-time quilts. And when I stepped back to look at the results, I can honestly say that I was stunned. They turned out even better than I'd hoped. My girls definitely take after Mommy: they love the design step better than any other part of the process. Bear had a blast picking out her scraps, and even though I had to call a halt to the selection process finally ("I want to use them all, Mommy! "), she ended up with the largest quilt of the three. I was amazed at how she really did seem to stick to a color scheme, and I loved that she added lots of neutrals in there. She even inspired me to put together a Fabric Audition based on her choices which I'll share with you later this week. One of many things I've learned through this experience -- let your kids sew with your good fabric. Pretty fabric makes a pretty quilt, no matter who's doing the sewing. Mouse was a little different. She dove into my bucket, grabbed her scraps, and was done in about two minutes flat. Surprised, I asked if she wanted to add more, but she shook her little head. "No," she said, "I'm good." Bear wanted to sew with me for quite a while, and then by the time we were on to the binding, she was ready to move on to other things. Mouse, on the other hand, wanted to sit on my lap for almost every stitch. She was even slightly offended that I wouldn't let her do any ironing, and I had to keep chasing her away from the cutting mat whenever I needed to trim something. It was all chatter and giggles and silly faces with these two little ones as we did our sewing. By the end, I was sewing the binding on Mouse's quilt while the three girls played "Fabric Shop" behind me. I did my best not to laugh aloud as I listened to their dialogue including little tidbits like "I'd like 10 and 1/9th feet of this one," or "So what are you going to make with this: a lampshade or a dress?" When I was finished, I had a mountain of fabric to refold and three happy little girls to tuck into bed with their treasured quilts. Over the past week I've spent a lot of time thinking about what it means to be a mother. Having three little daughters is hard work -- God forgive me for all the times that I, as a single teacher, thought that stay-at-home moms had it easy. There have been moments when the responsibilities and resulting exhaustion have been almost more than I could bear. Last weekend I devoured a copy of this book which I highly recommend to all overwhelmed mothers, especially those with young children. I came away with a much needed dose of hope, a few new strategies, and a renewed commitment to spend time learning to really love and understand my children. I'll be honest: there are times when I use my sewing as an escape from motherhood. While I don't think this is completely abnormal, I know that it's also not the best idea, especially for someone who sews as much as I do. Instead of using my sewing as a way to get away from my girls, I want to use it as a method for connecting with them more deeply. My girls have been begging me for months to teach them how to sew, so I decided that this week we were going to finally start. And today, Bunny and I finished her very first quilt. Keep in mind, my girls are young -- ages 6, 4, and almost 3 years old -- so I'm not going to hand them a rotary cutter and my sewing machine and say, "Have fun!" Instead, I let Bunny sift through my scrap bucket, picking out any pieces she liked. We spread these out on the floor and then she would bring me a scrap or two at a time as we slowly pieced together a log cabin. I did all the cutting and pressing, and often she would sit on my lap, helping me guide the fabric through the machine with her little hand on top of mine. We didn't always agree on her choices -- there are definitely some things that I would have done differently. When I tried to give her a little gentle advice about the wisdom of including a certain scrap, she looked at me with big eyes and said, "Mommy, it's my quilt. Can't I make it the way I want it?" I knew she was right, so I backed off and let her have free reign. I also soon learned that if I in any way showed that I liked a fabric she was thinking of adding, forget it -- she didn't want it anymore. I laughed about this later when I shared it with my husband and parents, all the while tucking it away as useful knowledge for future dealings with my independent daughter. While we sewed, we talked...a lot. I taught her new words like "seam allowance," "basting," and "binding." She chatted with me about school, her sisters, and upcoming holidays. We both shared reasons why we love sewing. When the last stitch was sewn on the binding, I was tired and my neck ached from trying to sew while looking around a six year old's head, but the satisfaction was incredible. And the look on Bunny's face...it was absolute joy. I had waited so long to sew with my girls because I thought they were too young, but they weren't really. I just needed to adjust my ideas of what sewing with them was going to be. Bunny didn't have to sew every stitch for it to be her quilt. And I gained the pleasure of time with my daughter and some valuable insights into her life. In the grand scheme of things, that's a pretty good deal. Issue 14 of the Fat Quarterly online magazine came out today, which means that I can finally share the project that kept me company all summer: my Charlotte Travel Bag. I designed this bag back in June using some leather yarn dyed Essex linen and a gorgeous bundle of Bijoux that Bari J sent to me. 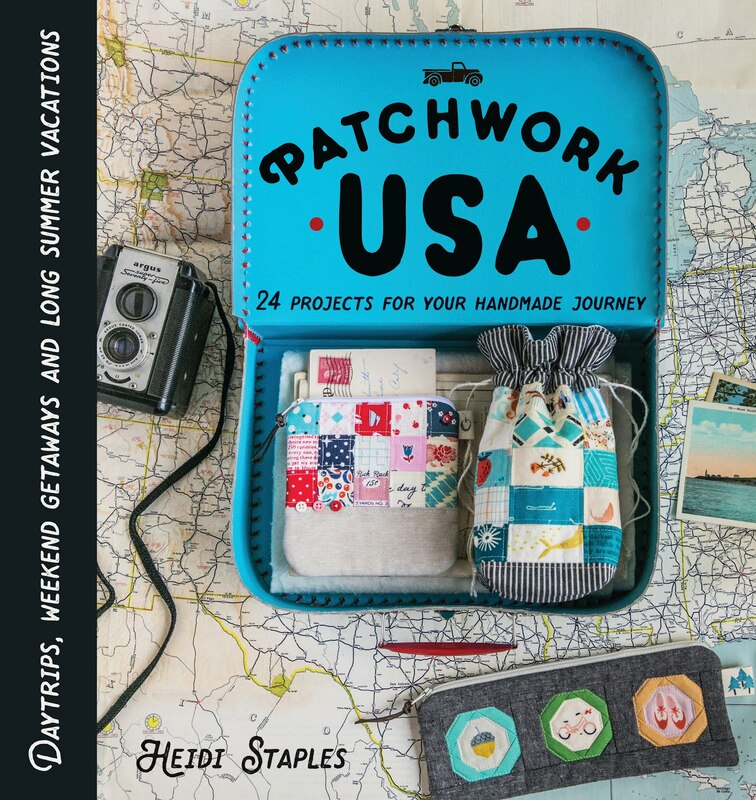 I love to bring sewing projects along when I travel, but usually a sewing kit alone isn't large enough to hold everything I need to keep me busy for, say, a week. This bag has room for it all, along with a detachable cross body strap for hands free carrying. It also has a fold over top (similar to my recent Rosette Clutch), pockets galore, and a few pieces of hardware, but really it's just a big fancy zipper pouch. As for the name? My husband and I had been watching some of our favorite Jane Austen movies back at the end of spring. I was thinking about this bag one night when I recalled that scene from Pride and Prejudice (the iconic Colin Firth version, of course) where Lizzie has come to visit her newlywed friend Charlotte. Charlotte is explaining how her husband stays busy elsewhere most of the time while she enjoys spending the day quietly in her own sitting room. "I find that I can bear the solitude quite cheerfully," she says with a meaningful smile. While I am blessed with a far superior husband to that of fictional Charlotte, I can certainly appreciate a few quiet moments with my needle and thread and the goodies I've been packing in this happy bag. If you'd like to do the same, you can purchase your copy of Fat Quarterly's summer issue here. Joann Fabrics and I have an on-again, off-again relationship. It's close, it's convenient, and it has some pretty great sales every month. Unfortunately, it typically also has some pretty dreadful customer service. I don't know about the stores near you, but it seems like each one I visit has this same problem. In fact, I had such an awful experience with an employee at the cutting counter last month that my husband begged me not to darken their doors again. So as I seem to do every other month or so, I decided that this time -- really! -- I was breaking up with Joann Fabrics once and for all. And then they released the Rosette collection. Have you seen these fabrics? Anna Maria Horner has obviously passed both her beauty and talent down to her daughter Juliana, who has made an absolutely stunning debut with this line. I fell in love immediately with the soft vintage look of these designs. The florals are sweet, and the wicker print is genius. They look even more gorgeous in person. Last night my amazingly wonderful dad handed me some money and insisted that my husband and I go to a steakhouse for dinner on them while he and my mom watched the kids. And after walking on a grateful cloud for most of today looking forward to tonight's special event, I decided at the last minute that a date night clutch was in order. It took me all of thirty minutes to sew together this little bag which I've now decided is my favorite clutch of all time.